Sector-specific sanctions imposed by the EU and U.S. on state-owned Russian banks have already led to an increase in the cost of credit in Russia, while overdue retail loans have increased by one third. Analysts warn that in order to restrain growth in overdue payments, banks will have to raise interest rates further. Russian banks have increased the rate on loans to industrial companies by 2 percent due to sector-specific sanctions on government-owned banks imposed by the European Union and the United States, Deputy Minister of Industry and Trade Yury Slusar announced on August 15. According to Slusar, the rise in rates has caused major companies to change the business models of new projects underway. This is the first formal evaluation of the impact of sanctions on Russian companies. Earlier, the U.S. and EU banned state-owned Russian banks from borrowing money for periods exceeding 90 days. As a result, as Bank of America Merrill Lynch research published in Russian business daily Vedomosti said, Russian companies are precluded from issuing Eurobonds, and only private companies can access syndicated loans. According to analysts, some banks have already raised rates on new business loans to 25-28 percent annually. “The increase in rates stems from the shortage of funds due to Western restrictions on lending to Russian companies,” said Alexei Kozlov, chief analyst at UFS IC. According to Kozlov, the government will attempt to intervene in the situation, curtailing the growth in rates and offering relatively low-cost loans. This is indicated by the fact that Russian companies are continuing to borrow. Despite the rise in rates over the first seven months of the year, the volume of lending to the corporate sector in Russia has increased by 10.5 percent. According to data from the Central Bank of Russia, in the second quarter of this year Russian companies increased borrowing from abroad by 2.5 percent to $13 billion, and these loans need to be refinanced. According to Pavel Simonenko, the head of CIS sales at Dukascopy Bank SA, rising rates have a negative impact on Russian industry, in particular on competitiveness, as high rates keep companies from modernizing facilities. “While the situation is not critical, it is nonetheless difficult – corporate loans to medium-sized businesses already exceed an average of 15 percent annually, while the requirements imposed on borrowers by banks have tightened dramatically due to a lack of liquidity and stricter supervision from the Central Bank,” Simonenko said. Moreover, Simonenko said that the Central Bank is giving an additional boost to rates. The key rate has already tripled from the beginning of the year, from 5.5 percent to 8 percent per annum. “In fact, major banks are no longer able to refinance debt to the West,” says Finam analyst Anton Soroko. In his words, it is likely that the Central Bank itself will have to step in to resolve the situation, helping state owned banks survive the sanctions without significant losses. “The best situation is in the mortgage market, as increases in the cost of borrowing are kept in check by a variety of subsidy programs, and a number of refinancing options,” says Soroko. Amid rising rates, we are also seeing increasing arrears on Russian bank loans. 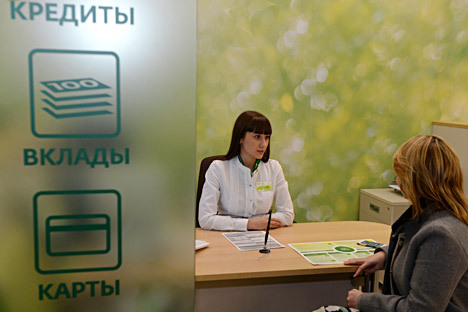 According to the Central Bank, arrears grew by 33 percent to 587.6 billion rubles ($16.3 billion) in the first seven months of 2014. “The growth in rates will certainly put additional pressure on the business environment in the regions. This is particularly true of late, with contracting consumer demand, declining profitability, and the risk of the economy slipping into recession,” said Dmitry Bedenkov, the analyst at IC Russ-Invest. According to Investcafe analyst Mikhail Kuzim, the growth in arrears is leading to the need to further raise rates and tighten credit conditions. “Cash loans and credit card rates may be 1.5-2.5 percent higher over the medium term,” he said.